I’m loving my to-do list today. It’s all nice and scratched out. My list has been a formidable challenge for me lately. I’ve been very fortunate and was asked to contribute projects to three different books – a modern quilt design book, a softies book and a general craft book. I’ve been working on these projects on and off for months and today I’m a few photographs shy of being All Done! All Done! In reality this just gives me a brief moment to breathe in before I jump on to the rest of my list but I’m very happy to have that moment. I thought I’d take the opportunity to ruffle it up. 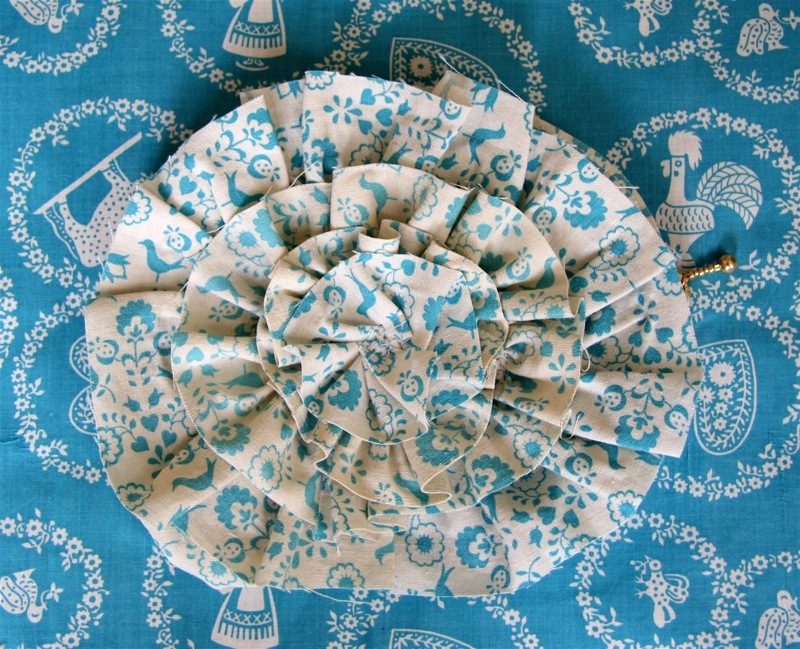 I made a ruffled carrysmall from some of my newly thrifted fabric. I’m happy with it but it still needs a lining and maybe a ruffle on the back too. And I need one of those rufflers. Manual ruffling is for the birds. Oooo a softies book … I can’t wait to see it!!! I used to have a ruffle attachment for my old, old Singer. I am still mad at myself for selling that machine – solid steel! Anyway, now I ruffle using an old 4-H trick you might enjoy trying: make a big, giant zig-zag stitch over a piece of string. Affix one end and pull up the string to ruffle. Voila! …you don’t know me, but I just started my own knitting blog about a month ago and I thoroughly enjoy your blog! I’m very excited to try making my own wee bunny and pointy kitty! ok, just wanted to stop by & say hello! Adorable, I love it very much! I’ve never been a ruffle gal, but you are really turning me with all your cute ones. I’m seeing them in a whole new light. And I will be truly excited to see your “works” published. You must be an expert in time management, you craft like a fine tuned machine. god this fabric!!! amazing colors and design. and i love your ruffle. Ruffling is for the birds – ha, ha! It looks great! Love the fabric. Wow..nice ruffles!!! I bought my ruffler at a thrift store for $1 I have also used the 4-H trick previously posted. didn’t photo the bunnies…but will soon. Is that a bag? That’s amazing! I had a ruffle moment recently too (http://jillianbeans.blogspot.com/2006/02/frilly-bits-for-hens-do.html). They were so fiddly but so worth it! Wow, can’t wait to hear all about your new projects! A modern quilt design book? Oooh, tell me more, I would like to anticipate it eagerly. I’m a card-carrying ruffle lover, too. But I’ve never thought of a ruffled flower. Fantastic! three books! fantastic Hillary, your work is so beautiful you absolutely should be getting published. I just found your site by chance. I am stunned! Everything you do is exquisite. Oh I love this one! Beautiful! I can imagine it atop a gorgeous present all wrapped with a topper like that…yum.